Ohh…how cool is this? This year marks the 3rd year of Sky Celebrations Fair! Planning your dream party couldn’t get easier than this as Sky Cable brings together some of the most sought-after suppliers in one roof. Helping you plan a celebration of any kind, Sky Celebrations Fair is THE place to get tons of ideas and inspiration for both experienced and newbie party planners alike. From event styling, photo & video coverage, celebration cakes & desserts, photobooth, invitations, giveaways and more, Sky Celebrations Fair got your back. 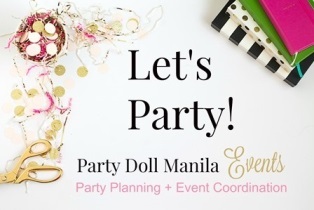 For more party planning tips, see my supplier check list here and party theme ideas here. Here’s your chance to know the people behind the brands. Showcasing their products and services for us to see, it’ll be a whole day full of fun and discoveries! Remember, don’t be shy to ask them questions. Since most of us are planning a once in a lifetime celebration, always do your research first. Special thanks to Sky Cable together with ATC Healthcare, National Bookstore and Fun Ranch for bringing us “Celebrations Fair – Your Party Needs in One Roof” (Year 3)! Join us this September 5, 2015, Saturday, from 11:00am to 7:00pm at the Rockwell Tent. Are you wondering who’s joining this year’s fair? A big shout-out to Christine for sharing with us the list of exhibitors. Why attend Sky Celebrations Fair 2015? 6. And I’m giving away 10 special Party Doll Manila tote bag to 10 of my readers! For more details, follow Sky Celebrations Fair on facebook.